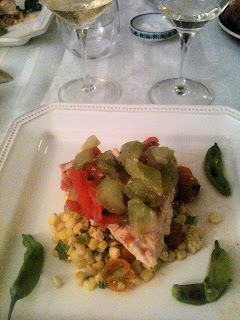 Some of my Favorite Champagnes with Fried Food...Who Knew? Apparently a lot of people know about this combination, this antithetical pairing of delicately nuanced Champagne with the greasy heavy fist of fried food. I remember reading Peter's post about this a while back, and thinking, "Hmmm, I'd sooner take a bottle of Champagne to drink at a monster truck rally." But as with so very many other things, my friends, I was wrong. Champagne and fried food do somehow go together very well. 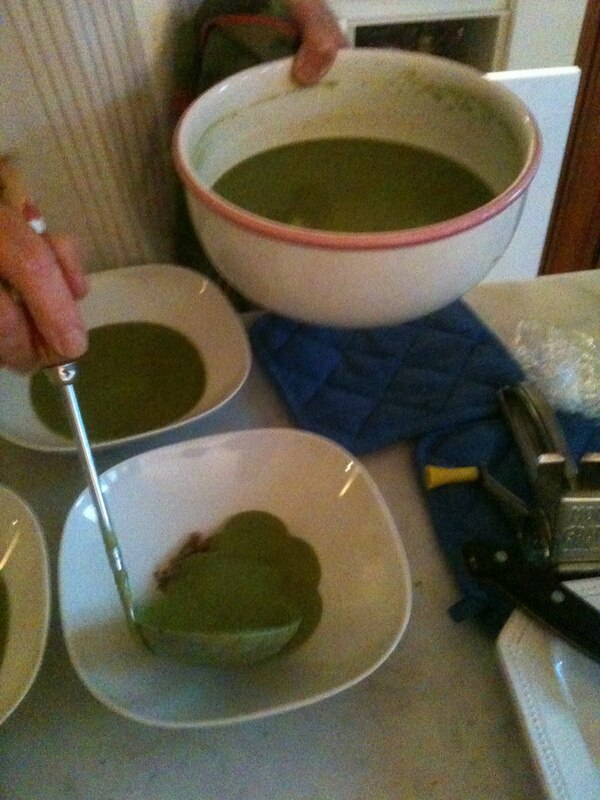 And fried food, when well made, doesn't even overpower the wine. I recently happened to have the opportunity to drink several absolutely excellent Champagnes with skillfully fried food, with delicious results. At a dinner put on by Charlie Woods of Bonhomie Wine Imports, we ate large plates of fried oysters with aioli. They were plump and briny, encased in some sort of lightly seasoned cornmeal mixture, and carefully deep fried. I say carefully, because careless deep frying results in greasy food, over or undercooked food, or food that tastes more of the fryer than of itself. These oysters were pretty perfect. There were several Champagnes on the table, as Bonhomie brings in a small but wonderful group of Champagnes, wines that you should unhesitatingly seek out if you enjoy Champagne. With the oysters I drank a relatively unknown but incredibly delicious and interesting wine, the 2004 Michel Loriot Pinot Meunier Vieilles Vignes Brut, $75. 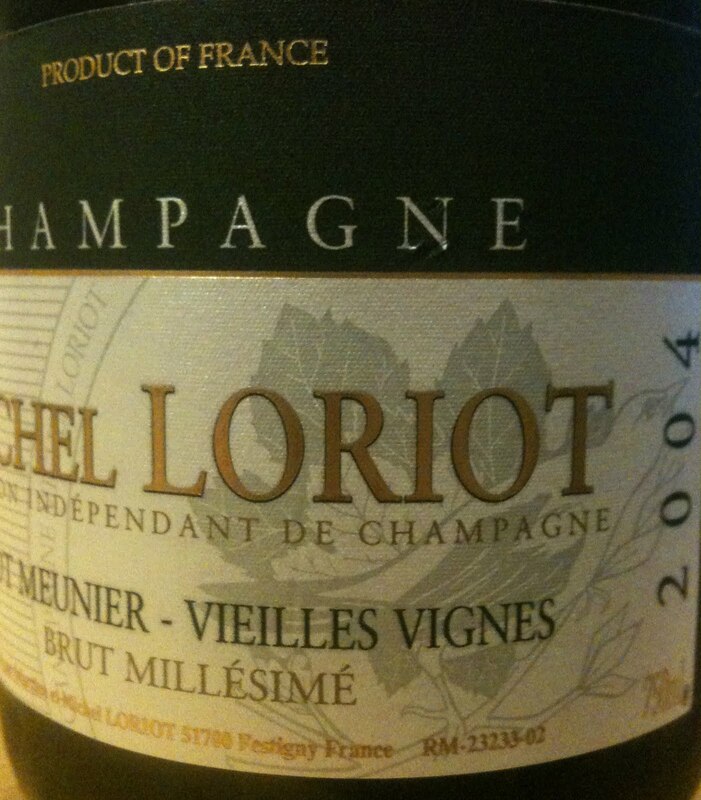 According to ChampagneGuide.net, Loriot's estate is located in Festigny, a village in the quiet (read: backwater) Flagot Valley, at the western edge of wine production in the Marne Valley. 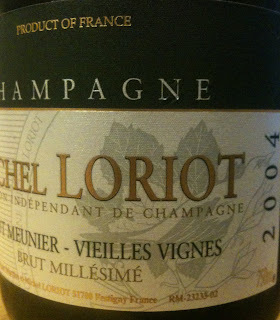 Meunier does very well in this part of the Marne, and Michel Loriot makes several Meunier-based wines. From what I've tasted, this one is the most special, from vines that are over 40 years old. I absolutely love this wine, with its great intensity of flavor, its sharp focus and balance, and its harmonious expression. 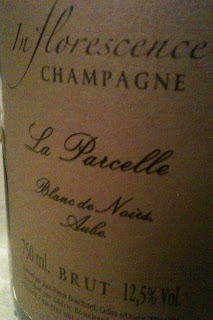 It doesn't feel like Meunier - it has not the slightest hint of rusticity, none of that roundness, the cashew-inflected fruit. Not that those things are bad, but this wine is a unique expression of Meunier, and it was fantastic with fried oysters. Loriot's wines are not so easy to find, and this one particularly rare. If you want to try it, Astor Wines has it on the shelves right now, and I hear that a few other shops are considering carrying it - in a few weeks try Uva or Slope Cellars in Brooklyn. It's distributed by David Bowler, so you can always check there. At the same dinner we drank several wines by Marie-Noëlle Ledru, one of my favorite producers in Champagne. The whole lineup here is great, one wine better than the next. The non-vintage Extra-Brut we drank was based on wines from 2007 and 2006, but because of the ripe richness of the wine, I guessed it was based on 2008. 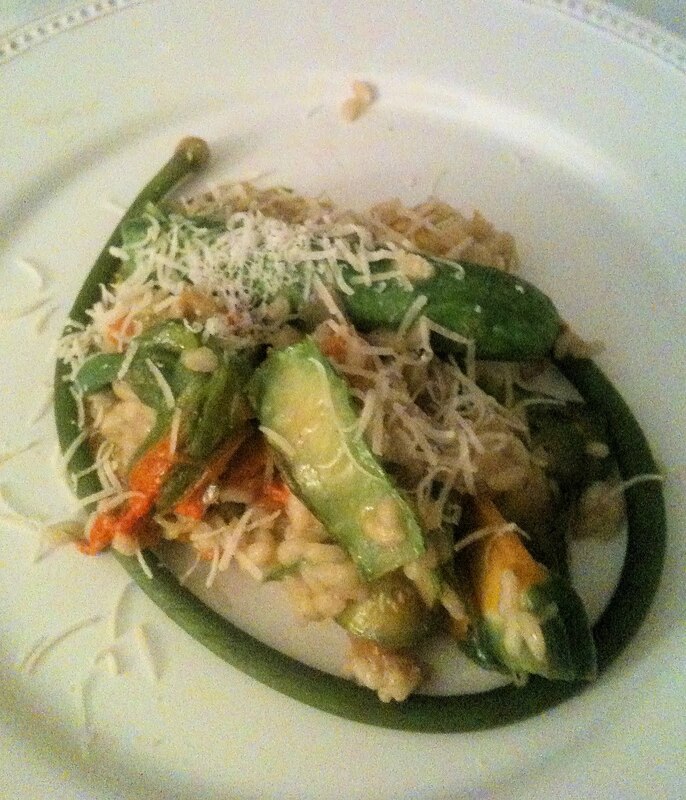 In any case, it's delicious, zesty and fresh, perfectly balanced, and with surprising intensity. Ledru's top wine, the 2006 Cuvée du Goulté (best of the best) of Ambonnay, was constricted and tight on this evening, as might be expected in its youth. Still, its character and class show through clearly, and it will be great in time. My favorite on this night was the 2002 Brut Nature with its beautiful red fruit that really lasts in the nostrils, its vibrancy and clarity. It also happened to be wonderful with french fries. 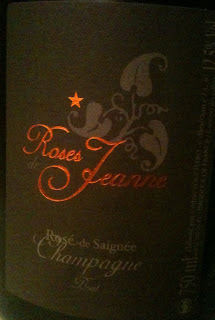 Ledru's wines have become easier to find, as word is out - these are some of the finest, and also the least expensive (!) wines from Ambonnay. You should try one if you haven't already, and all of the usual suspects in NYC carry them. At lunch one recent day, also with fried oysters, we drank a beautiful bottle of NV Benoît Lahaye Grand Cru Brut Nature, $45, Jeffrey Alpert Selections. 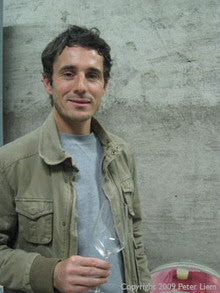 Peter Liem put it bluntly: "Lahaye is now the best producer in Bouzy, and in 10 years everyone will know that he is an absolute superstar." I have yet to encounter the Lahaye wine that I don't love. This wine is based on 2008, and it's vibrant and graceful, very pure and fresh. 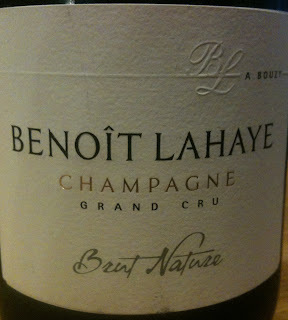 That it is Brut Nature is almost beside the point - it is perfectly ripe and balanced - it just happens not to be dosed. Lahaye's wines, sadly, are almost impossible to find. Joe Salamone at Crush has been stocking them for a while now though, so you might try there if you're looking. I hope that these wines become more readily available, and that the whole lineup makes it to the States, not only the non-vintage wines. The NV Brut Nature, by the way, was great with fried oysters, which brought out the wine's salinity and mineral undertones. "Accidents" - Let's start simple and ubiquitous. There is no chance to avoid this, to offload the chore onto your partner if you are a single parent. No laundry to go pick up, paychecks to go deposit...It's all you, and you are dealing with poopies and pee, in pants, on dresses, on the floor, everywhere. A good wine pairing can help. I find that something highly aromatic is best here, something with a tremendously long finish. If you don't want to think too hard about this, simply open anything that has been scored at least a 94 by Robert Parker. But so far, the finest pairing I've experienced is a pungent Amontillado Sherry, and preferably one that is a little on the sweet side. Try Valdespino's Contrabandista, if you can find it. Kids Won't Go to Sleep - You know the deal, it's a solid hour and a half after bedtime, and they're still talking, laughing, arguing, singing, getting out of bed to go to the bathroom or ask for more water. I find here that a good rosé works very well, but very dry. You want to echo and amplify their joy, and the austere and hopefully bitter finish will remind you that you are on your own and you have about 2 hours total of adult time until you too should be sleeping, or you will not be able to get up with them at 7:00 AM. Kids Wake Up at 5:45 AM - Sleep begets sleep, as most parents have discovered. And when they stay up too late, they will be up early too. But the problem is, you're a single parent and there are no more deals to be made, no more "Please honey, just let me sleep now and I swear to you that I will take both of them all afternoon and you can do whatever you want." Clearly you need coffee, strong and plentiful. And you know what, I'm going to keep the rest of this one to myself. The Meltdown - This is so much easier when there were two parents. Mainly, because a child's meltdown can so easily lead to a parent's meltdown, and when there are two parents, one is likely to remain rational. Now, it's all about preventing the accompanying adult meltdown. 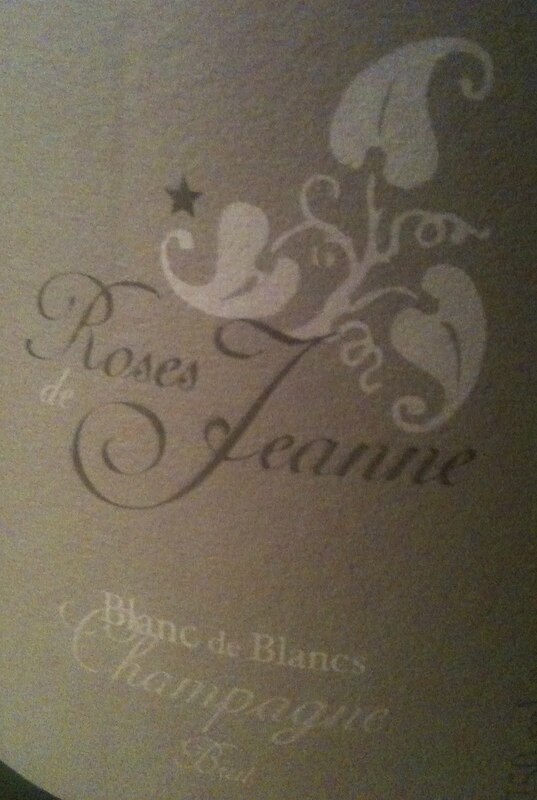 Here I recommend something special, like Clos Rougeard or Jacky Truchot. What you're looking for isn't one particular type of wine, you're looking for balance and purity. This is a powerful idea and I suggest that you single parents try it. Why just the other day one of my kids had an absurd meltdown on the bus, the kind where everyone else is looking at you thinking that you are the most pathetic dad ever. Obviously I couldn't dig into my cellar at that time, but I merely thought about drinking the 1999 Lafarge Volnay 1er Cru Clos des Chênes, and honestly I felt a little better. Broken Glass - Your younger child, say two and a half years old, is drinking milk from a glass that you put on her table. It's a low table and she can stand near it, pick up the glass, drink, and return it to the table without any problems. She's done it literally thousands of times. You go to the bathroom to run their bath, and while it's running, quickly try to sweep the floor in the hallway where they just stood eating pretzels. You feel happy, satisfied at multitasking, and then hear a loud shattering crash in the bathroom. Your two and a half year old has carried her glass into the bathroom and dropped it, smashing it all over the tile. "Don't move!" you say, eyeballing the zillions of shards. But she moves, and steps on one, and cuts her toe. Cursing yourself at not using a plastic cup, you simply pick her up and place her, crying, in the tub. Soon she is happily playing, her sister too, and you are on your hands and knees sweeping up glass. In this situation I recommend a booze drink. Gin makes sense as it is the strongest booze. I find that the bitterness of the Negroni works well, and as an added bonus, the sanguine color is reminiscent of the blood from the poor child's foot. Bath Time Screaming - Happily playing in the bath doesn't necessarily translate to happy times while washing hair and body. When there were two parents, I was sometimes the one sitting on the couch reading the New Yorker and pretending that I was deaf. Single parents never read the New Yorker, I can tell you that. Instead we wash our childrens' hair and bodies, over their loud and emphatic protestations, perhaps stopping to remove a little glass from a toe. Here I find again that booze is your best bet, perhaps unsullied with vermouth, seltzer, juices or any sort of mixers. Just booze. I like whiskey. Excessive Squabbling - You know, kids need to learn how to work it out themselves. In a safe environment with an adult nearby, it's important for children to experience conflict and attempt to resolve it on their own. Sometimes my own crankiness as a single parent makes my kids cranky, and they squabble. When it gets excessive and I'm about ready to poke myself in the eye with a sharp stick, I remember that this is normal, and that actually instead of hovering and trying to resolve their problem for them, I might actually be more helpful to them if I simply sit back and let it unfold. I like beer here, preferably a bracing and refreshing pilsner. Lately ice cold Radeberger has been my go-to choice. This bitter pils actually refreshes, so much so that when they occasionally work out their problem, no one hurt or crying, and actually resume whatever they were playing, I feel even as a single parent, well enough to pick them both up in my arms and kiss them and tell them how proud of them I am. While taking a long walk the other day after work, I stopped in at a wine store where I used to shop, but never really go anymore. I very much like the woman who buys the wine there. She has an interesting and slightly frustrating job because the store is a little neighborhood place with no internet sales, they sell bottles to customers who walk in, that's it. Most sales are of the $10 variety, I would guess. And she has to keep the shelves stocked with wines that her customers want. But she is a devout lover of fine wine, has been in the business for 30 plus years, and she simply cannot carry many of the wines she loves the most, never mind hand-sell them to people who come in looking for a cheap bottle of white wine from the fridge. Anyway, she was telling me about a trip she took this past spring, a junket, if you will. She said that she never goes on these things because she doesn't want to engage in any kind of quid pro quo. But this time the group putting on the trip told her "You've been buying wine from us for years and we want to say thank you, this isn't about getting you to buy anything." And so she went to Spain, to Galicia and to Rioja. We had lunch after tasting in the morning, and the lunch ended at something like 4:30, so I went back to the hotel and rested for a while, and then we met again at 6:00 and spent almost two hours walking through the vineyards. After that we had a long tasting in the winery, and then sat down to dinner in the winery at 10:30! They served us a special kind of Ibérico ham, an aged ham by the producer Joselito, considered to be the very best in Spain for Ibérico. The hams can age for years. We ate a 3 year old ham and it was carefully sliced and served on its own and I loved it, so complex. The next morning on the bus, our guide who was a winemaker and very passionate about Spanish cuisine, was almost tearing his hair out, saying that the ham was served all wrong! He said that it was sliced entirely too thick, first of all, and that the texture was therefore wrong. And secondly he said that the temperature in the room was too cold - it was cellar temperature. This special kind of ham should be served at room temperature so the oils that provide the special aroma and flavor come to the surface of each thin slice, so that the fat literally melts in your mouth. Too cold, and you miss out a big part of what makes the experience so special. Wow, I thought, this guy is really serious about this ham. I didn't think much more about it until a day or so later in Rioja while having lunch at another winery, when they served another Joselito Ibérico ham, this one a little younger, maybe 2 years aged. And this time, it was perfectly sliced, and served at room temperature. And it was remarkable how much better it was, the aromas and flavors more profound. I left the store and continued my walk , and I thought about how some of the most special things we can eat and drink require several kinds of knowledge and experience in order to appreciate them at their fullest. Imagine if an average citizen, a person who drinks wine from time to time but isn't in the game were to be served a bottle of La Tâche. They might be told by their host that this is one of the finest examples of Burgundy wine, or of any wine. And imagine if it were served straight out of a refrigerator at 38 degrees. Or if it were served from a cabinet in the kitchen right next to the stove at 88 degrees. Or if it were served in a water glass. The wine is still La Tâche, but served like that it will not demonstrate its full potential as one of the world's greatest wines. Of course this is true not only for La Tâche but for a $16 bottle of Muscadet, too. Served too warm, it's just not as charming. When I am experiencing a new wine, I love it when the person introducing me to the wine can teach me how to appreciate it at its fullest. For example, I recently learned that brown Sherries, Amontillados and Olorosos, tend to show best when served in a smaller glass, like a copita (assuming it is a quality glass), and Fino and Manzanillas tend to show better in a white wine glass. I would have assumed the other way around, maybe. I want to know these things, or at least hear about them and test them for myself, if I'm going to spend my money on good Sherry. If I were to buy Ibérico ham, I would hope that the purveyor would teach me the best way to enjoy it, especially since it costs about $85 a pound. It can be tricky when the tables are turned. 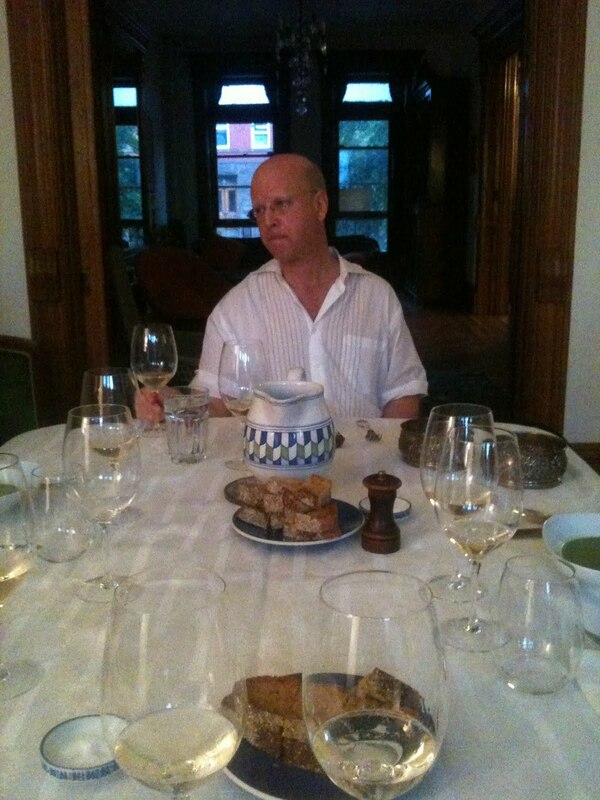 If I am a guest and some one is serving something to me, and if I happen to know that they are doing so in a way that prevents the wine (or food) from showing at its best, it is tempting to say something, to offer friendly advice. And if it is a close friend, some times I find a way to do that. The occasion rarely presents itself with close friends, however, as my close friends all seem to know so much more about these things than I do. When it's not a close friend, there's nothing to do but to happily enjoy what's being served however it's being served. At a restaurant I don't say anything either, unless I'm served a wine in glasses that are plainly wrong, and even then only if I know that the restaurant has a better glass they could easily grab for me from behind the bar. And still, I feel awkward doing even that. I wish that I could find a non-awkward way to share whatever it is that I know with people, or to ask for things at restaurants that I know will improve my experience. It's so hard to do so without coming off like a fastidious little jerk, no matter how cool one is when asking. It's worth thinking about these things though. It's not about being a snob, it's about learning to find the greatest pleasure that a thing has to offer, and that's something that I hope I will never stop doing. 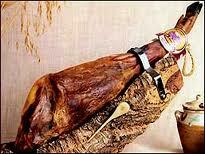 A link to a nice article, although outdated, about Ibérico ham.